•Exterior surface adapts satin polish. • Steam: Dimple plate jacket with inlet/outlet fittings for Steam heat transfer. • Electric: Use electric heaters in jacket to heat the medium in the jacket. • Gas fired: Use gas burner at bottom to heat tank directly. 100% Pressure & leak testing of all tanks, jackets, and hardpiping. All eletronics and brewhouses pre-assembled and tested before shipping. 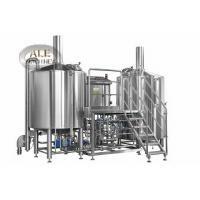 We provide turnkey system, onsite installation service for brewery projects. We are preparing to supply technology service at any time, will offer equipment handbook, electrical appliance drawing and machinery drawing to customers with the equipment. 2. All accessories and spare parts will be packaged with seperated box.